"A Wild Call" by Martyn Murray is one of those all-too-rare books that you just know you are going to remember, a book you can expect to come to mind at odd moments as you encounter the joys and challenges of your own everyday life. It's beautifully written and eminently readable, but those aren't the characteristics that make it stand out and give it such an enduring quality. What really makes this book special is that it is thought-provoking and inspirational. Will it make you look at the world around you in a different light? That probably depends on you, but it just might. The Martyn Murray we encounter at the start of this book is a man with a job that many would envy. He's a field biologist and conservationist who has carved out a niche for himself as a self-employed consultant, frequently travelling to far-flung corners of the world, and to Africa in particular. Yet he's also a man who feels trapped within the cage he's built for himself. He want's something different, something better, but what? The death of his father reawakens in Martyn memories from decades earlier of sailing with his family off the western coast of Scotland. The dream grows of buying a old boat with lots of character and revisiting old haunts: and in particular of sailing to St Kilda. The first part of the book follows Martyn through his often fruitless efforts to find the right boat, and then to the south coast of Ireland where he knows in his heart he's found it, while his head is warning he's taken on far too much. Restoring "Molio" to seaworthy condition and bringing her back to Scotland is an epic adventure in itself, made all the more more challenging by his developing relationship with the alluring but complex and fragile Kyla, a woman he hopes will share his dreams for the future but whom he struggles to understand. We then follow Martyn on his first major expedition up Scotland's west coast, as far as a stormy Plockton, and then on a final voyage in which he reaches his longed-for destination. No, that's not a spoiler. Anyone looking at the photo on the rear cover showing Molio at anchor off St Kilda will know that Martyn achieves his geographical goals. But what of his emotional goals? Does he succeed in breaking out of his self-imposed cage? And what about his severely star-crossed relationship with Kyla? We'll let you find out for yourself: but can offer the assurance that doing so is a thoroughly enjoyable experience. As we read this book, it was with the growing sense that it reminded us of something: something we'd read long, long ago. It took us until about half-way through to realise just what it reminded us of. There is a sense in which "A Wild Call" could equally have been called "Zen and the Art of Boat Maintenance". It's actually far more approachable and readable than Robert M. Pirsig's great classic, but there are similarities in the way in which the story is told and the themes are addressed. Both books have at their heart a journey; and both have protagonists who seem to spend as much time repairing their chosen modes of transport as actually travelling. Both deal with interpersonal tensions that are initially hard to understand. Both are set against a sometimes rather hazy background, and both are books of ideas. Martyn Murray has spared his readers Robert M. Pirsig extensive forays into deep philosophical waters, and his book is far more accessible because of it: but he is able to discuss concerns that are prevalent in the modern world in a way that will resonate with many. 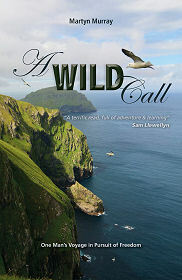 "A Wild Call" is a book we thoroughly enjoyed and are glad to have read.